Broadband networking. Its something that EVERYONE wants in their home…in every home across America... heck, in every home across the world. The biggest problem with getting broadband in your home is not necessarily availability (though that is an issue), but piping the signal though your home. While 802.11(b/g/n) is easy enough to configure and easy enough to implement, its not always the most cost effective, and then there’s always the issue of signal penetration in your home. Its one of the main reasons why I don’t have a wireless router in my home. The signal simply won’t reach up to the second floor where my bedrooms are (my cable modem connection is in my basement, see above). 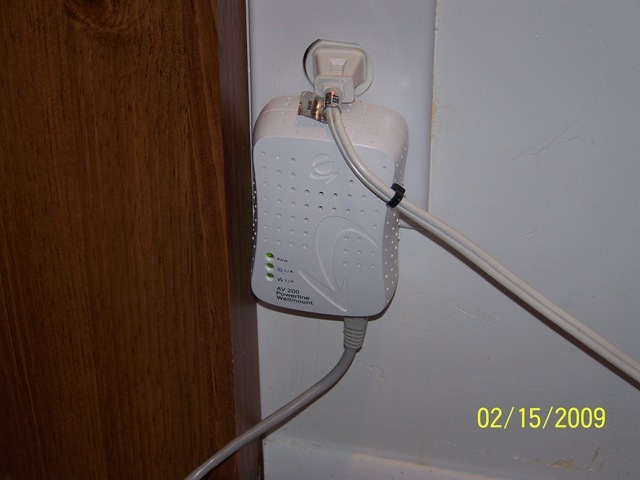 This is the Home Net wall mount connected to my router (the connection you see coming out of the bottom of the unit comes from my router. This is the master link that connects the router’s network signal to the power lines in my home This is the second wall unit in my living room. Yes, I have my wireless router up, but my daughters G4 Powerbook doesn’t have WiFi in it, so she needs this in order to be able to surf and get mail. 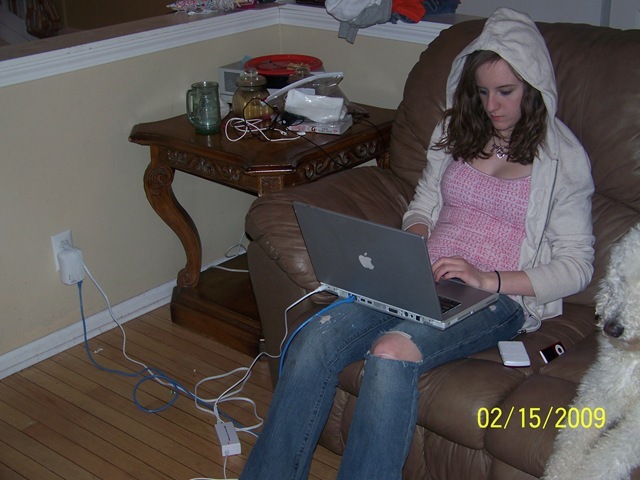 This is Amanda (and Bella, my standard poodle), surfng…likely on MySpace or Facebook or some such nonsense. As you can see, she’s plugged in to both a Corniex Home Net unit as well as AC Power. Amanda’s Propel and Nano are on the couch next to her.The Home Net unit connected to my router stays in the plug that its in. It never moves. The second unit can move anywhere in the house. 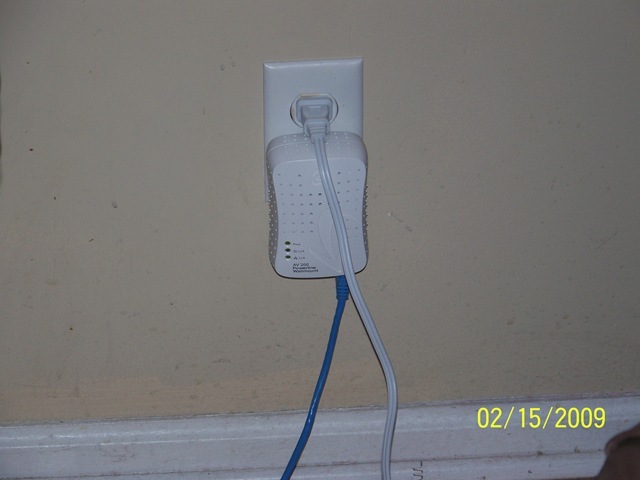 In fact, I can put more than one wall mount unit, into any plug or extension cord anywhere in the house. It doesn’t matter. As long as it has AC coming to it from a line in the house, it has a 200 mbs network signal coming to it.While 200mbs is better than the wireless b/g signal I’ve also got flowing through the house, it isn’t as convenient. While Powerline Networking is nearly 4x faster than 802.11b, you’re still tied to some kind of cord/tether (however, did I mention that is is 4x faster..? )If you need a network connection away from your wireless router, and you don’t have CAT5/6 running through you house (as most American’s don’t); or you simply don’t have wireless and don’t have that type of networking in your home, then GameNet or HomeNet may be your ticket.Honestly, these units are interchangeable, mixable, and provide a reliable network signal throughout your home. 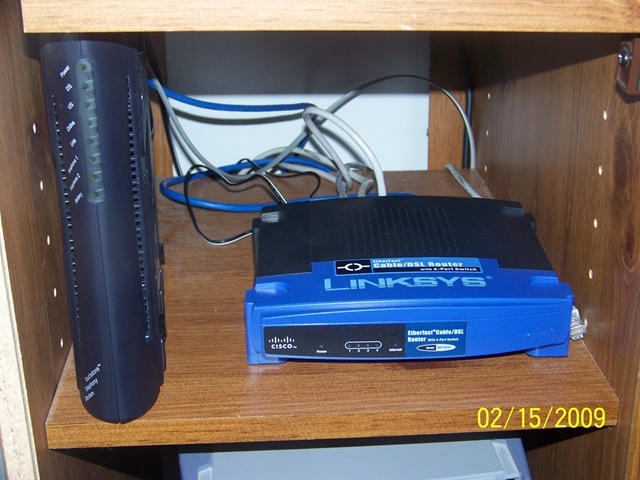 The only problem I had with them was that I couldn’t split the signal via a Linksys hub or switch and get more than one PC to share the signal at the same time (only one PC could get on at a time), despite what any Corinex representative said.However, this is a solid product, delivering a solid solution. If wireless just isn’t an option or if you want better than wireless speeds in your home, you really need to check these out, as they are one of the easiest networking implementations I’ve ever bumped into.Price: GameNet and HomeNet (basically the same thing) are available from Micro Center for $139.99. They are also available via Amazon, Buy.com, and New Egg, among others.What I liked: Being able to push my home network signal anywhere in the house regardless of the presence of CAT5/6 wiring or not.What needs Improvement: I wasn’t able to put the signal into a hug or switch so that I could split it, though Corinex claims that you can. Another colleague of mine who was also evaluating the products were not able to split the signal via hub or switch, either.